"I sat still for about five minutes and then my pipe got too hot. I put it down, looked at my strap watch, and got up to switch on a small radio in the corner beyond the end of the desk. When the A.C. hum died down, the last tinkle of a chime came out of the horn, then a voice was saying..."
by The New York Dolls, 1974. 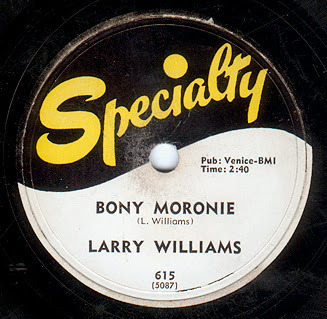 The first time I heard "Bony Maronie," it was not by Larry Williams, but by Johnny Winters and I was in my early teens, stoned, and trying to learn the riff on guitar in my friends basement. 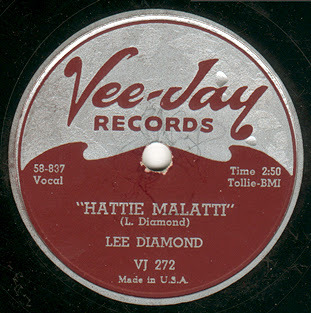 The first time I heard "Hattie Malattie" by Lee Diamond, I was sure it was some record company guy at Vee-Jay trying to come up with a "Bony Maronie" type of thing to get a hit. I wasn't stoned, but I was wrong. It does bear a resemblance to "Bony Maronie," but it turns out Lee Diamond is actually Wilbert Smith, part of Little Richard's tenor section in The Upsetters, and Lee Diamond's band is The Upsetters lumbering on after Little Richard gave up Rock and Roll and joined the ministry with Lee/Wilbert stepping up to the microphone. 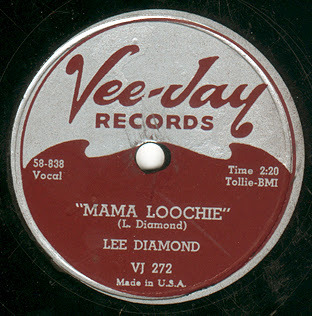 It's a pretty great record, as is the b-side "Mama Loochie." Both songs have unusual introductions that never reappear in the song. 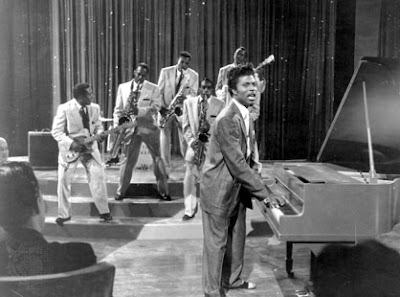 Wilbert can also be heard on "Why Do You Do Me" the b-side of James Brown's first Federal single, "Please, Please, Please" and on some of Little Richard's best Specialty sides, including the insane sonic attack of "Ooh!, My Soul." 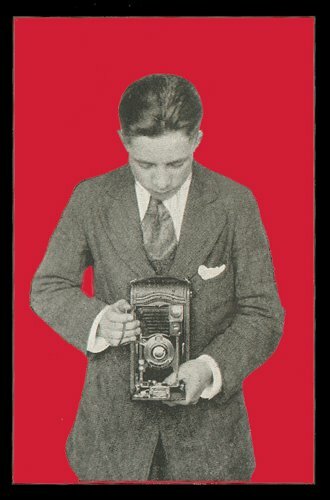 available on Live at Dancetown U.S.A. 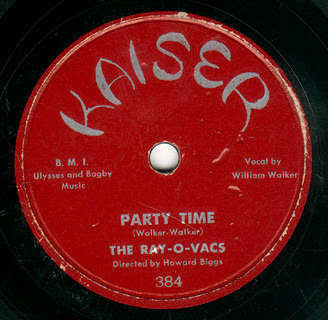 Here's a rocking record from The Ray-O-Vacs. I bought this record because I liked their name. Who wouldn't? I was not disappointed. Alright, that's my story and I'm gonna stick to it. 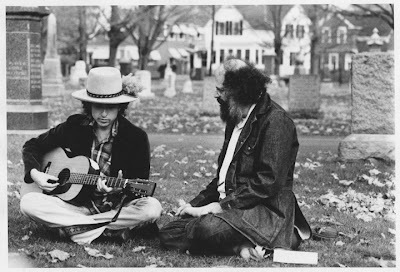 At the end of "See You Later, Allen Ginsberg," you can hear Bob Dylan start to say, "Let's erase..." (that!) or something to that effect. This track has most of what's great about the lighter tracks on the The Basement Tapes: humor, spontaneity, cannabis, and illicitness (it is a bootleg) and maybe we shouldn't be listening to it, or maybe it should have been erased as Dylan starts to suggest. Thankfully, it was not. 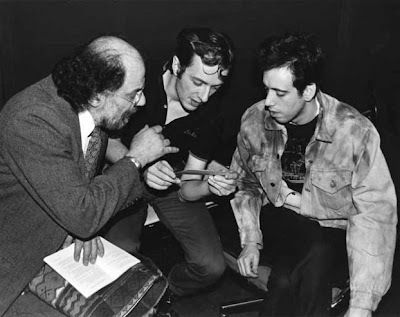 A few years later, Dylan heard Ginsberg at a reading, improvising poetry to some music and called him to talk about it. A week later they were in the studio recording with an assembled cast of characters including Anne Waldman and Happy Traum. 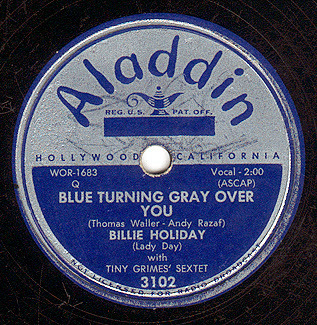 They recorded several tracks for what eventually became Ginsberg's record First Blues, including "Put Your Money Down," which is the traditional sea shanty "Pay Me Your Money Down" and "For You, Oh Babe For You," which to my ears sounds more like late period Velvet Underground than anything else. So, with that in mind I've assembled a sprawling little playlist here, that follows a tagent beginning with Dylan and moving on to some live Velvets from 1969; The Modern Lovers, who used to the Velvets' sound as a starting point; Wilco who nailed it on at least one track and another performance of Ginsberg from 1982 with The Clash. "See You Later, Allen Ginsberg"
by Bob Dylan & The Band, 1967. "For You, Oh Babe For You"
By Bob Dylan & Allen Ginsberg, 1971. "Sweet Bonnie Brown/It's Just Too Much"
by The Modern Lovers, 1972.
by The Clash with Allen Ginsberg, 1982. ... and I shall do just that. 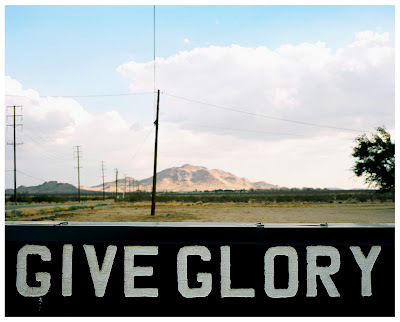 top photograph: Give Glory © Ted Barron, 2007. A few months ago, I bought this record on eBay. 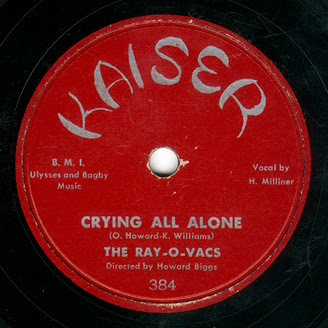 I purchased it because it was cheap and on the Ace record label, and 90% of those records are great, including the one for which this blog is named. 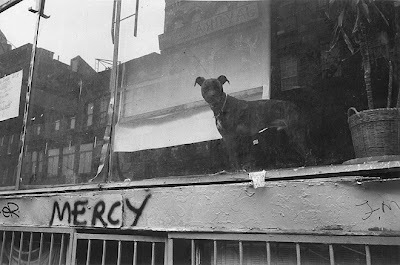 I had no idea who Mercy Baby was and neither did the guy who sold it to me. He listed it as Mercy Dee in parentheses and I didn't know much about him either, except as a passing name when browsing for records. 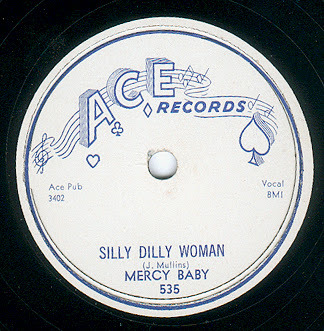 After I won the auction, I did a little web research on Mercy Dee, whose record I thought I had just bought and made a startling discovery. Years ago, my friend, roommate, and cohort from art school Bruce Silcox, with whom I spent many hours listening to and playing music with gave me a cassette tape he made (at the library I think) with no track listing of a Texas Blues compilation labeled only "'dis be it blues." He excitedly played me an hysterically funny song called "Eighth Wonder of the World" in which a guy runs through a list of bad strategies for testing his woman's love, I've had this tape for over 20 years and had no idea who it was. More than once, I spent a considerable amount of time fishing around the web and trying to figure it out to no avail. So, while looking at track listings of Mercy Dee records on Amazon to find out what the record I just bought sounded like - that wasn't Mercy Dee after all - I came across "Eighth Wonder of the World," and listened to a sound sample to find out what I'd been trying to figure out for all these years. 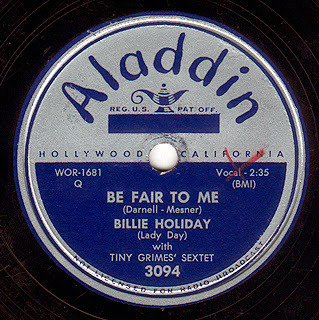 Below, we have the record I bought, which is fantastic by the way, featuring Frankie Lee Sims on guitar backing up Mercy Baby (AKA Jimmy Mullins). 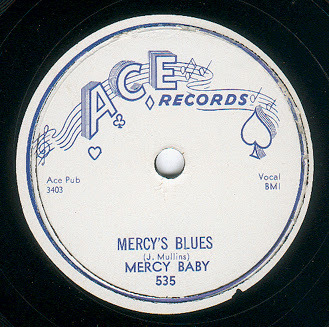 Mullins, like Mercy Dee Walton is a Texas blues piano player. On the A-side "Silly Dilly Woman," I'm not sure, but I think he refers to his woman as a "hole" or maybe it's the more common "ho." You tell me - I'm not sure. 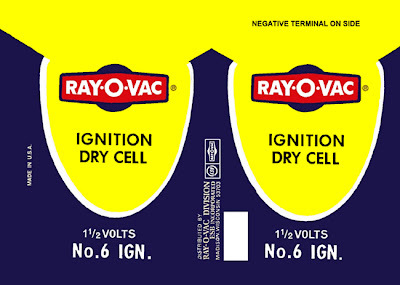 Either way, in my experience, this has proven to be as ineffective as the strategies illustrated in Mercy Dee's composition. 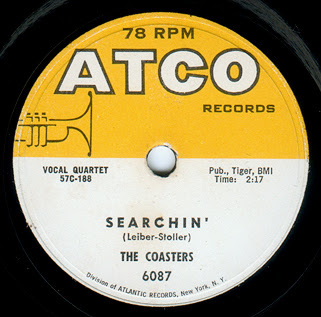 Rhythmically it bears some resemblance to Rosco Gordon's shuffling proto-calypso rock. Also check out the way the drummer throws the accents during the saxophone solo. 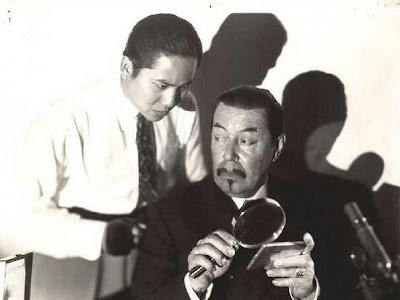 Frankie Lee cuts loose on the b-side. Also, we get Mercy Dee doing "Eight Wonder" and his most famous composition, "One Room Country Shack," as well as a cover of it by Mose Allison, who was a fan of Mercy Dee and included it on his first record Back Country Suite. Additionally a song that uses mercy as an exclamation of love, and a pair of songs begging for mercy in love and in life. 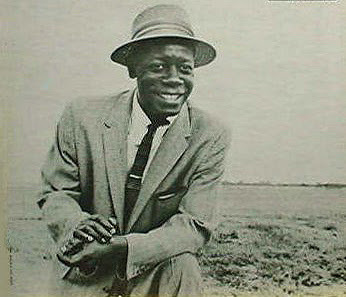 by Mercy Dee Walton, 1953.
by Mercy Dee Walton, 1961.
by Larry Williams and Johnny "Guitar" Watson, 1967. Well, the Boogie Woogie Flu was launched a year ago today. 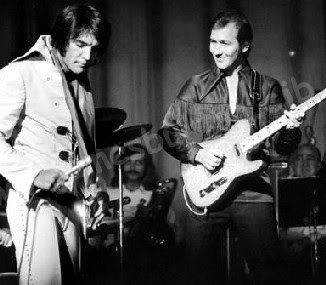 After a year in Fluville, I find it fitting to once again listen to Elvis, being that it is his birthday today as well, and while he never made it to seventy-three, I really never planned for this blog to make it to one - but responsibility calls so we'll pay tribute to the King, and listen to James Burton and the TCB band backing up the big E.
In 1951, Billie Holiday recorded one session for Aladdin Records with tenor guitarist Tiny Grimes leading the band. Haywood Henry is on saxophone and Bobby Tucker on piano. 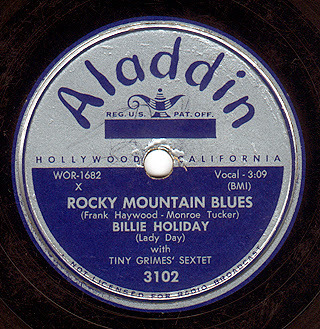 These four sides (in particular "Rocky Mountain Blues" - in which she sings "I'll be high on that mountain" which for her had a dual meaning) are the closest she came to recording Rhythm and Blues. They are unmistakably her- yet different than anything else she recorded. 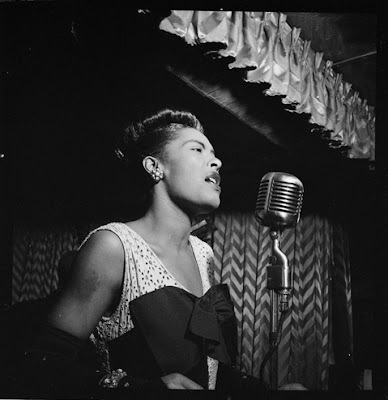 by Billie Holiday with Tiny Grimes' Sextet, 1951.